In this incisive reinterpretation of the history of the American labor movement, Howard Kimeldorf challenges received thinking about rank-and-file workers and the character of their unions. Battling for American Labor answers the baffling question of how, while mounting some of the most aggressive challenges to employing classes anywhere in the world, organized labor in the United States has warmly embraced the capitalist system of which they are a part. Rejecting conventional understandings of American unionism, Kimeldorf argues that what has long been the hallmark of organized labor in the United States—its distinctive reliance on worker self-organization and direct economic action—can be seen as a particular kind of syndicalism. Kimeldorf brings this syndicalism to life through two rich and compelling case studies of unionization efforts by Philadelphia longshoremen and New York City culinary workers during the opening decades of the twentieth century. 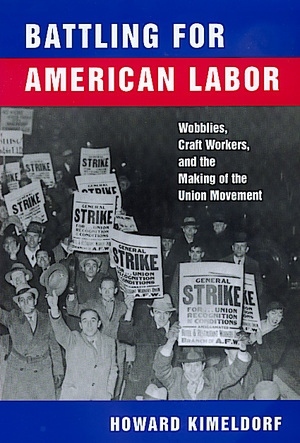 He shows how these workers, initially affiliated with the radical IWW and later the conservative AFL, pursued a common logic of collective action at the point of production that largely dictated their choice of unions. Elegantly written and deeply engaging, Battling for American Labor offers insights not only into how the American labor movement got to where it is today, but how it might possibly reinvent itself in the years ahead. Howard Kimeldorf is Professor of Sociology at the University of Michigan and author of Reds or Rackets? The Making of Radical and Conservative Unions on the Waterfront (California, 1988).